Okay, so I got lazy and didn't make the actual "cornucopias" suggested in the recipe: puff pastry strips formed around a tinfoil "horn," baked, and filled with the vegetable mixture. Too much work in my opinion, so I opted to only make the roasted veggies with gravy. I'll start off with the gravy. What an amazing flavor it had, and what a mouthwatering aroma filled the kitchen as it cooked...and boy, did it cook. Total time probably was about two hours. That being said, the gravy was made from scratch with a vegetable stock-like base. But as the mixture of onions, carrots, garlic, and mushrooms carmelized, I kept thinking what a wonderful soup it would have made. Next add white wine, sun-dried tomatoes, and fresh herbs...and OMG this would have been so delicious with some added beans or potatoes for soup. And this mixture would have also been a wonderful vegetable stock (although I'd never go through the trouble of making a stock from scratch, this might have all other store-bought varieties beat). This mixture then is added to a roux...but it didn't quite thicken up enough for a true gravy consistency. Cornstarch (or more roux) will definitely need to be added. And the roasted veggies were...well, roasted veggies. 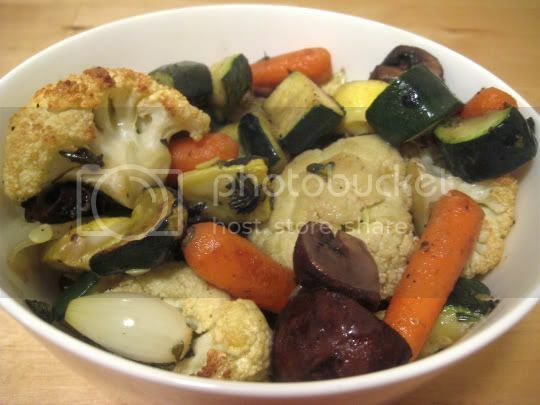 Cauliflower, zucchini, squash, onions, carrots, mushrooms, and fresh herbs...simple, and not much to rave about. It's the gravy that truly made this stellar. Make again? Veggies? No. Gravy? Um, if time permits.